On April 26, SHPE LM Aero attended the final TAMU General Meeting of the spring semester with Professional Speaker for Company Infosession, Resume Workshop, and following the meeting it concluded with the annual TAMU/LM Aero SHPE new E-Board Officer MentorSHPE program. This is the continuation of a great SHPE partnership between TAMU SHPE and LM Aero and spans beyond 2012 with professional speaker series, technical talks, MentorSHPE, ACE, SHPE Jr., and lake social activities over the years. Congratulations to the new 2017-2018 TAMU SHPE Officers and we're looking to seeing what good things are to come in the future! Gig 'em. 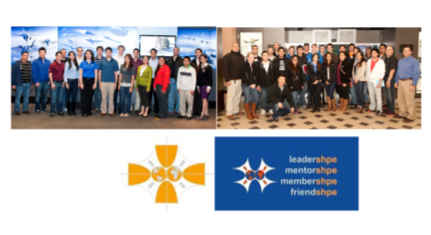 On April 22, the SHPE LM Aero chapter hosted our SHPE College Professional LM Tour Series with SHPE Texas Christian University (TCU), UT Arlington (UTA), and UT Dallas (UTD). SHPE TCU is one of the newest future student college chapters in Region 5 founded by several of the SHPE LM Aero Fort Worth Trimble Tech SHPE Jr. alumni students. The purpose of the event is to provide mentoring and community engagement with the local SHPE college chapter to provide professional development. The event included a keynote speaker, Duane Cuttrell – L E&T Operations Director, who talked about is career journey and gave a company overview of Lockheed Martin Corporation, a tour of the F-35 production line , and Recruiting and Resume workshop on the process and how to get a job at Lockheed Martin. Volunteers included Aaron Prokopchuk, Juan Hernandez, and James Narey. The day concluded with a post-event lunch social at restaurant in the local Fort Worth area. On May 16, SHPE LM Aero held their last CO event of the current SHPE year. We exceeded our overall strategic CO goals! Another SHPE National Pre-College 4-2-1 program "Get Out and STEM" event in the books with our annual ACE Junior LM Industry Day series in collaboration with Fort Worth Trimble Tech HS SHPE Jr. and Brewer Middle School Lego Lab program students. This is our 6th annual event. We had 38 students in attendance for the meeting in the LM AVC Innovation Room. Thanks to all the volunteers that helped make it happen and to the entire 2016-2017 SHPE LM Aero CO Board on a successful year. Our students had the opportunity to learn about the corporation from a senior manager keynote speaker, see the world-class F-35 manufacturing line, hone their piloting skills in the F-35 cockpit simulator, and practice their design skills in a team competition building their very own Brizzle Bot Robot Bugs STEM activity. Some raffle prizes were provided to individuals that demonstrated their knowledge in STEM trivia based on what they learned during the tour and other workshops and speakers during the day. On April 21, the Trinity SHPE Jr. Chapter established on February 2012 as an official NAVSEA SHPE National junior chapter recently held their annual EOY Celebration and new officer elections meeting. The officers presented EOY Member Awards and Senior Graduation Stoles. We had pizza and cupcakes for snacks. The members running for President, Internal VP, External VP, Secretary, Treasurer, Director of Communications, and Director of Academic Excellence gave a brief 3 minute candidate speech and then the members voted on ballots. The meeting was the culmination of another successful year and chapter growth. We exceeded our 2016-2017 chapter goals under the new SHPE National Project 4-2-1 curriculum by conducting 5 Hands-on STEM activities. Congratulations to all the graduating seniors and the 2016-2017 Trinity SHPE Jr. Officers. Best of luck on finals, AP and IB exams in May! 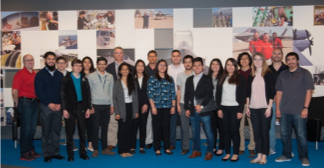 On April 22, the SHPE LM Aero chapter hosted 18 college students from 3 of our SHPE buddy student college chapters including SHPE Texas Christian University (TCU), UT Arlington, and UT Dallas. The purpose of the event is to provide mentoring and community engagement with the local SHPE college chapter to provide professional development. 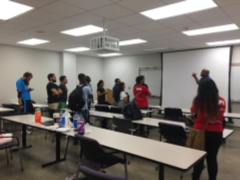 The event included a keynote speaker, Mr. Duane Cuttrell – Deputy VP of Engineering and Operations Director who talked about is career journey and gave a company overview of Lockheed Martin Corporation. The SHPE LM Aero volunteers, Aaron Prokopchuk, Juan Hernandez, and James Narey gave the SHPE college students a tour of the F-35 production line following by a Recruiting and Resume workshop on the process and how to get a job at Lockheed Martin. The day concluded with a post-event lunch social at restaurant in the area. Community Outreach: SHPE UTA/UTD College Tour Series. Volunteers Needed!! SHPE LM Aero is planning a SHPE LM Aero professional development college tour on March 3rd in collaboration with SHPE UTA and UT Dallas. The tour will include a brief LM overview info session, assembly line tour followed by a post-event lunch networking social. We will need 5-6 volunteers to help with security escorts, tour scooter drivers, or speaker opportunity. If you would like to help, please contact Jose Ortega for volunteering! 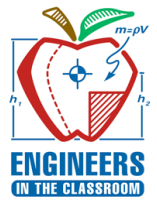 As the academic year gets underway, SHPE LM Aero is seeking volunteers to assist with STEM activity facilitators or professional speakers at Fort Worth Trimble Tech, Euless Trinity, and Fort Worth Northside HS on the scheduled mentoring meeting dates. The activity materials and speaking topics will be provided. All that is required is to go to the school and be willing to interact and engage with the students. A charge number can be provided. Please contact James Narey (SHPE Jr. Lead) for more information and how to sign-up!! Charge number will be provided!!! 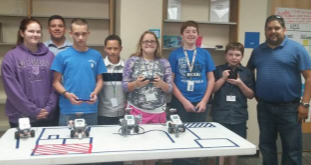 The lab sessions take place every Monday from 3:45-5:00 pm and they run throughout the school year in White Settlement’s Brewer Middle School. The minimum commitment is 1.5 hrs. per month by rotating volunteers. Charge number will be provided!! !